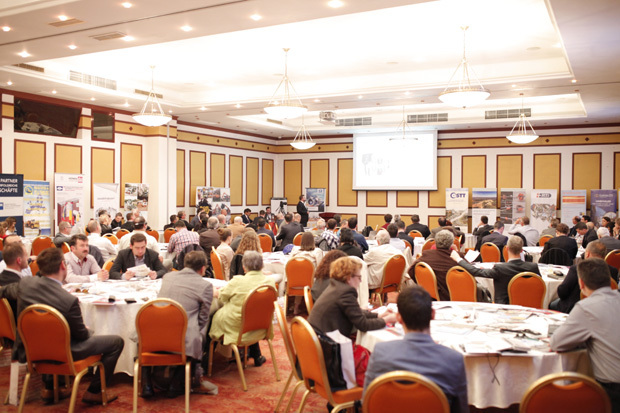 The event was attended by more than 200 participants including producers and distributors for trenchless technologies, construction machinery distributors (Germany, Austria, Holland, USA, Saudi Arabia, UK, Greece, Bulgaria, Turkey), network operators, contractors, water companies, gas and sewerage, main local associations as well as local and regional authorities. Representants of Austrian Embassy in Bucharest and Romanian-German Chamber of Commerce and Industry were also present at the event. Among the special guests of this first edition was Jens Hölterhoff-Chairman GSTT, Dan Ulian Szekely-Vice President of ROSTT and Graham Evans, representative UKSTT. More than 20 specialists and experts sustained their presentations during the three conference sessions. The event offered the possibility of exposure and presentation of the most revolutionary products and equipment currently in use in indoor and outdoor spaces. The event was moderated by well-known presentors Constantin Opris (the Money Channel) and Aneta Singeorzan (Realitatea TV). All participants enjoyed at the end of the day an artistic program offered by Larisa Barbu traditional dance company, followed by traditional Romanian dinner. Faster, more economical, more efficient, more environmentally friendly! Trenchless Technologies are pioneering techniques which combine economic efficiency and environmental protection thus providing a modern approach for the installation, replacement or renewal of all underground utilities from, water, sewer, gas, and industrial pipelines to electrical conduit and fibre optics with minimum excavation and surface disruption.